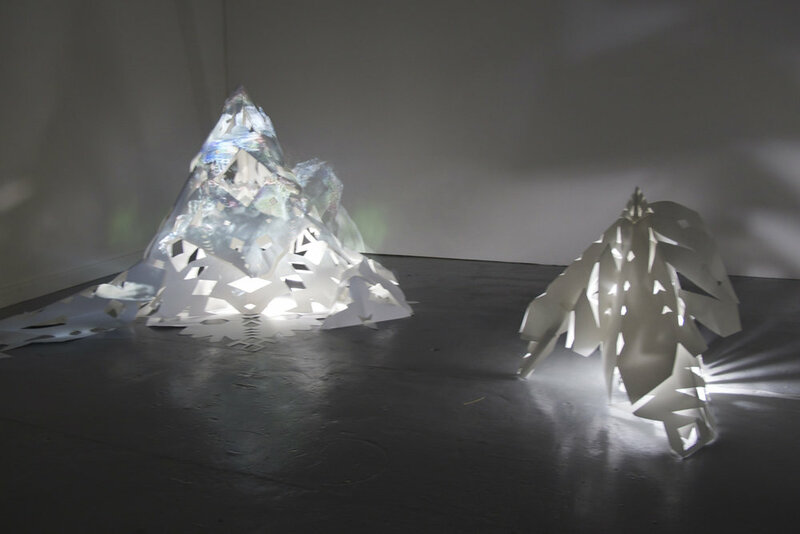 Lauren Simmonds creates kinetic installations that are part performance, part anthropological study and part handmade craft. Transfigure see her choosing to work with a vast range of materials, which contrast each other, including fragile papers and cheap reflective plastics. The viewer is immersed in a dark world of flickering forms – forms without reference. 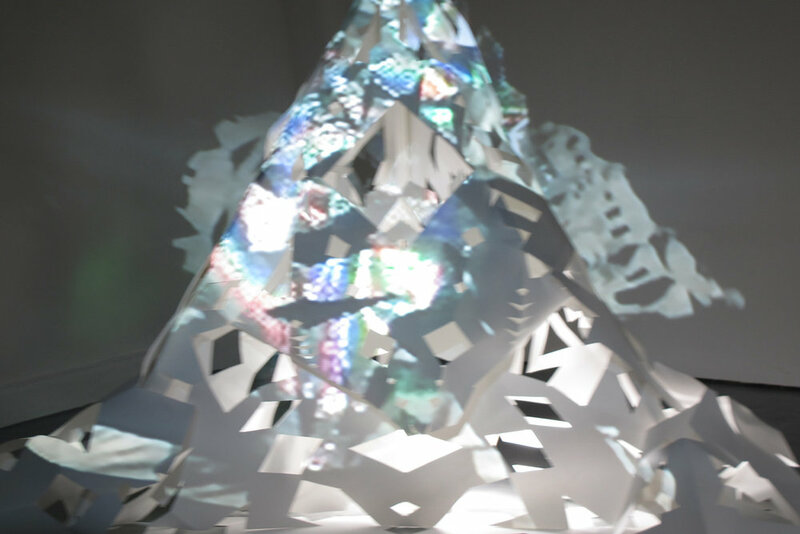 An abstract creature, clad in paper and plastic, is projected onto the surface of two static, paper cut-out sculptures – juxtaposing static, intricate forms with the dynamic gesture and movement of human body. transform into something more beautiful or elevated : the world is made luminous and is transfigured. ORIGIN Middle English: from Old French transfigurer or Latin transfigurare, from trans- across + figura – figure. In Transfigure, the viewer is drawn into a dark world of flickering forms – forms without immediate reference. Two figures, clad in paper and plastic cut-outs, are projected onto the surface of static, paper cut-out sculptures. The figures breathe and move, without faces, without identities. Like visions projected onto the wall of a womb or the shadows of Plato’s cave, Simmonds’ work evokes archetypal responses from the unconscious. As we imagine her cut, cut, cutting her fragile, recycled papers and plastics, we start to see how she creates the creatures that she pulls forth via her shears. Yet, she resists creating obvious forms or meanings. She resists giving these sculptures a literal face. It is up to us, the viewers, to do that. For Simmonds, her ritualistic and repetitive cutting is fuelled by the desire to unearth something new from the psyche. Her patterns call up unseen and unasked-for responses in herself, as well as in the viewer. Simmonds’ work brings up associations with traditional American Indian clothing, Egyptian hieroglyphics, tattoo culture, sea creatures (from the microscopic to the mammoth), the 80s punk aesthetic and crystal geometry. Yet she is a purveyor of new forms that, while being contemporary, hark back to a more primitive culture where people expressed themselves primarily through gestures, textures, lines and sounds rather than the written word. In today’s world, where the image has returned to paramount importance and meaning is ‘in’, her works are a pertinent meditation on how we can create a new visual language outside of capitalist agendas. For Simmonds, the act of cutting everyday materials (such as paper and plastic) is an entry point into the super-real world of the unconscious. Lines become feelings and the slicing of the paper – which in many ancient traditions is akin to the slicing of the intellect creates dynamic contrasts that open multiple entry points for the viewer. Her organic forms, that also encase her own body, also raise questions about the viewer’s own skin. In Transfigure, materials dictate form. And, though the artist uses her body to create the movements of the sculptures, she chooses to make them unrecognisable as human. This again reflects the work’s theme of the unconscious moving beneath aesthetic form, as Simmonds’ own body moves beneath the hand-cut sculptures. The sculptures are like masks, yet here they reveal more than they conceal. Her video sculptures conjure thoughts of amorphic organisms that slowly breathe and change and, as they move on the surface of the static sculptures, the interplay of light and shade distorts the movements and creates tension between the shadow and the light; the static forms and the forms in motion; the colours and the monotones; and the silence and the sound. This tension is palpable, and accentuates the work’s heightened feelings. In 2000, Simmonds began working in pencil and paint, and over the following decade she branched out into sculpture and installation. Last year, Simmonds completed a residency in Berlin with Takt Kunstprojektraum that fuelled the development of her current interdisciplinary approach where movement, performance, video and sound come to the fore. In Transfigure’s live performances, Simmonds (clad in her paper-and-plastic sculptures) moves through the exhibition space like an ephemeral, meditative spirit. This spirit asks nothing of the viewer, and proscribes no answers. The fragile materials reflect the fragility of human feelings, and the quietness of the movements creates unexpected voids. Viewing Simmonds’ work is like engaging with a four-dimensional, Rorschach inkblot print. In Transfigure, her manipulation of ordinary materials and tools – paper, plastic and scissors – transfigures the mundane into an aesthetic that reveals our own unconscious beings. This projects has been assisted by the Australian Government through the Australia Council for the Arts, its arts funding and advisory body, and by the Visual Arts and Craft Strategy, an initiative of the Australian, State and Territory Governments.